I woke up from my cat nap to a heavy downpour outside. The rain was coming down strong and hard and it was bleak and dark. Groggy and grumpy from lack of sleep, I made my way to the kitchen with Chubbs hot on my trail. I avoided tripping on my fluffy friend; focused on the first thing on my mind - coffee! Pots and pans were forming a small mountain inside my sink and I was dreading having to wash the bulk from yesterday's cooking. Lack of a dishwasher at home means all the washing has to be done manually by me and sometimes, I am simply not in the mood to clean. I needed my coffee and I needed it ASAP! We don't have a coffee maker that works so there's no ready coffee with my name waiting for me in the kitchen. I'd have to make a fresh cup myself if I wanted my morning pick-me-up. Perhaps it's high time we shop for a new coffee maker, one that is efficient, easy to operate and will keep my coffee flow going from morning till night! Addicted to coffee is my not so secret vice and without it, I won't be able to function well. Warm and fuzzy from holding a steaming mug of coffee, I made my way back to the living-room to watch a little TV. Outside, the chaotic rain was relentless but I am no longer grumpy. For with a sip of my coffee, the world no longer seemed dreary and bleak. And I am finally ready to start my day so good morning world! haven't had coffee yet ni.. off to MIL then to a client appt.. see you later!! Aiyah coffee sounds so good on this cold dreary day lah!! :* :* :* :* LJ Meow 1! :* :* :* :* Monica! 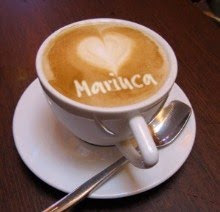 :* :* :* :* Mariuca! u oso just woke up? $$$$$$ is uppermost on my mind now…need more moolah to shop!! i just chopped 1 RM PB $10! go check yrs!! Done with work, think I will finish dropping ec first, then only ZZZZZ! No sign of rain here too but yest damn heavy rain!! yalor and i ve to switch off my lappie coz of lightning!! So when are u going to get new lappy Mon? Too lazy to drop EC now..
u mean the topics not great? I meant the total amount not woo hoo kinda wow he he he!! !